‘The Laundry and other stories of migrant women’ is a collection of 15 short texts based on the life history of women who arrived at Geneva driven away from their homes by wars, persecution, misery or the search of a better life. Despite the traumas that marked their paths, thanks to their courage and resilience, the protagonists managed to overcome their difficulties and reconstruct their life. They come from different countries from Algeria to Turkey, from Argentina to Ruanda, from very different social and cultural backgrounds, but their stories tell what unites us all: our quest to give a meaning to our life, to live in freedom, dignity, love, solidarity and justice. Through the stories of these lives, the major tragic events of our times - that made millions of people refugees and exiled - are evoked from the Armenian genocide to the Yugoslav wars, from the two world wars to the upheavals of the Middle East. The stories are told in different narrative styles that include classic short stories and fables with magic dimensions, in a poetic language that occasionally turns into bitterly ironic. "…in this collection of short stories YK. finds the just and poetic tone to speak about a question of actuality in the language of literature." « The Laundry is a guide of elemental human feelings, of the search of a better life. (…) With the wisdom of a storyteller who has a driving license in neuroscience, YK. seems to handle perfectly the distribution of chemical substances that evoke empathy. For her, Geneva becomes a place of strong emotions; one will not look any longer at a stranger on the tram without wondering what it was like her “once upon a time”." 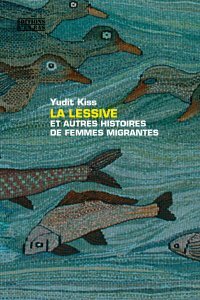 "... YK brings us the voice of migrant women who often do not dare or do not want to talk about the painful stages of their life and their migratory trajectories. YK aims to highlight the beauty and inner light of these women who suffered so much." In March 2018 La lessive was long-listed for the Hors Concours prize, the professional prize of French-language independent publishing.